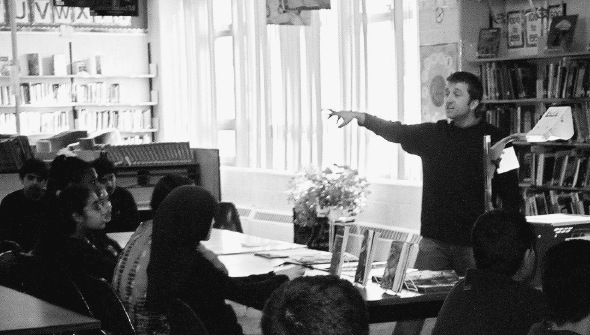 Toronto author Liam O'Donnell has been writing since he was ten years old. "It all started with some really bad rip-offs of my favourite TV shows, like Doctor Who. My early writing was short-lived because that was also around the time I discovered video games and Dungeons and Dragons. For the next 8 or 9 years I was busy mashing buttons and rolling funny shaped dice." Liam got back into writing while he was studying Radio Television Arts at Ryerson. He took a media writing course and says started "creating all these wacky ideas for children's TV shows, involving talking skateboards, walking trees and evil parking meters bend on ruling the world. 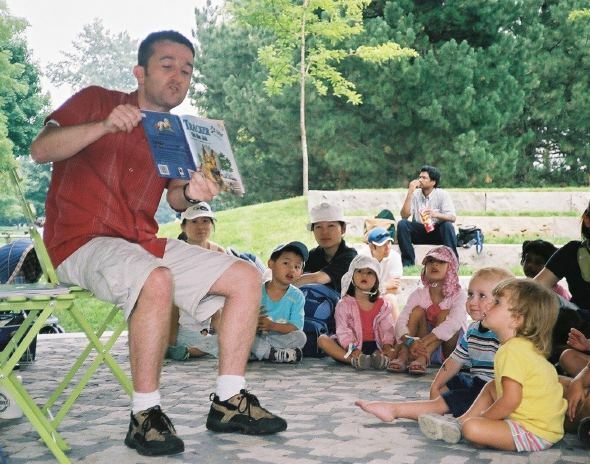 Thankfully those ideas never got beyond Ryerson's front doors, but it did spark a love for children's writing that has stuck with me ever since." I see from your blog that you have a graphic novel coming out from Orca. Could you tell me about it? I actually have two new graphic novels out this fall. 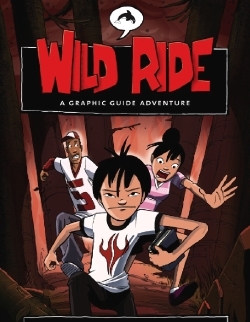 Wild Ride from Orca Publishers is the first in a new series, Graphic Guide Adventures. It's a wilderness survival adventure for 8 - 14 year olds, about three kids who get trapped in the woods of northern BC. In addition to the story, real life, step-by-step wilderness survival tips are blended into the action, so kids can learn how to build a shelter from tree branches, how to cross a river safely, set a broken limb and lots more fun stuff. It comes out in October. The next in the series is Ramp Rats, which is about skateboarding and is packed with instructions on how to land skating tricks. It comes out in 2008. 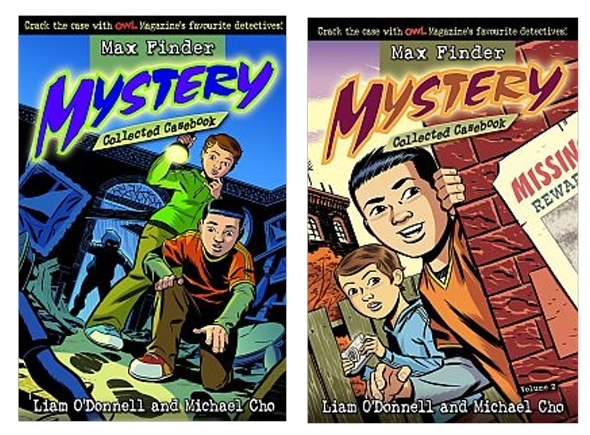 Coming out in September is Max Finder Mystery Collected Casebook Vol. 3, the third installment in my you-solve-it mystery comic, Max Finder Mystery, which ran in OWL Magazine for four years. 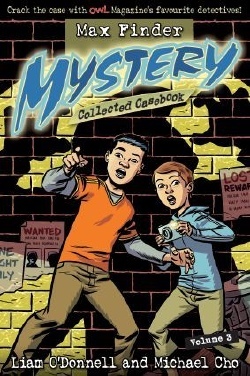 Aimed at readers aged 8-14 years, Max and his detective partner Alison Santos investigate mysteries that happen to kids in their neighbourhood - stolen bikes, missing baseball cards, vandalized property and much more. Max and Alison chase down the clues, but it's up to the readers to spot the clues and figure out whodunit. The series has been very popular and Collected Casebook Vol. 1 actually just won an award from the Association of Educational Publishers in the US. Both books, like most of my writing, are aimed at reluctant readers, who are put off by large blocks of text and demand action in their stories. The popularity of graphic novels has really seemed to have taken off in recent years. Any speculation as to why? I can't really speak for the popularity of adult graphic novels, which has been impressive in the past few years. I think the rise in interest in comics for kids has been partly fueled by kids getting into manga coming from Japan and the growing acceptance from parents and educators that there is literacy value in comics and graphic novels. For many years, the prevailing view was that kids weren't really gaining any literacy skills when reading their favourite comic. Thankfully, this attitude is changing, as adults watch their hardest to reach reluctant readers devour comics and come back for more, all the while showing that they are retaining the information in the stories and developing a love for reading. It's all about finding a topic that connects with the reader. And because graphic novels are a format and not a genre, they can cover just about any topic imaginable, from super hero action to non-fiction topics like the inner workings of electricity or photosynthesis. With an open range of topics and genres, chances are you can find a comic that will engage the particular interest of the reluctant reader in your life. Both traditional book publishers, like Orca and OwlKids, and educational publishers, like Capstone Press in the US, have caught onto this and are producing graphic novels covering a wide range of topics. As more adults struggle to get kids engaged in reading, they are realizing that graphic novels are a great way to get young minds hooked on reading. Once the love of reading is there, young readers can springboard onto longer, more traditional texts of the same topic. A reluctant reader who enjoys my Max Finder Mystery series might be ready to move onto a mystery novel book series, like the PC Hawke mysteries by Paul Zindel. This view of comics and graphic novels as legitimate reading material for kids will help them to continue to rise in popularity. Do you read graphic novels yourself? If so, which are your favourites? I totally read graphic novels and comics. While I'm not a comic geek with a basement full of plastic-wrapped Spiderman comics, I've always loved the format and I'm always on the hunt for other great comics. The Monkey vs Robot series by James Kochalka are definitely a lot of fun too. And I really enjoyed the recent Mouse Guard series by David Petersen. For some off-the-wall madness, I really enjoy Marc Bell's Shrimpy and Paul comics. 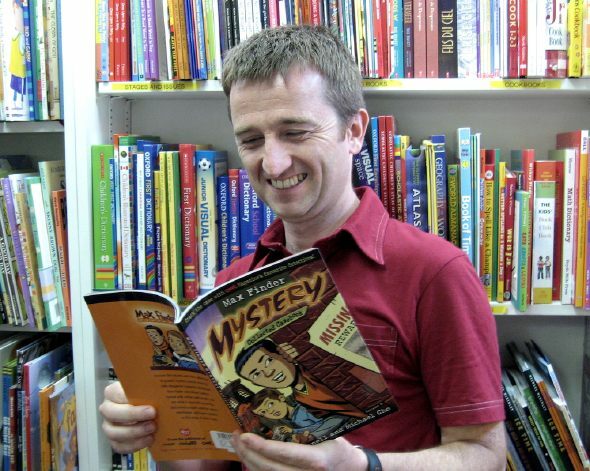 How does writing a graphic novel compare to writing a regular text- only novel? Writing a graphic novel is much more collaborative than writing straight narrative fiction. A graphic novel script is like a screenplay with the author giving stage directions, scene descriptions, etc for the illustrator. I always start with the characters and story and visualize how it will play out as I write it. Quite often the illustrator will see a better way to lay out a page or a scene and then we work together to tell the story visually. How often do you run into people who feel that writing for kids is easier than writing for adults? What's your response? Although people usually don't come right out and tell me that they think writing for kids is easier than writing for adults, but I know the attitude is there. If anything, successfully writing for kids can be a lot tougher than writing for adults. Adult readers will often forgive an author for a tedious bit of writing, flat characters or less than perfect plotting and continue reading the book just to see how it all ends. Kids have so many demands for their attention from TV, video games and other great books that at the first sign of anything tedious, flat or poorly plotted, they'll drop your book and move onto something else without another thought. What are your favourite bookstores in Toronto? Any of the independent stores in the city have my support. It's no secret that these are places to go if you want to engage with knowledgeable staff who share your passion for reading. Book City in Bloor West Village is my local store and they're great about making sure to stock the books from the surprising number of authors and illustrators that live in the neighbourhood. I also recently went to Type on Queen street for the first time. It was for the launch of Colin Frizzel's new book Just J, and really liked what I saw. The store was small, the staff very friendly and very open to supporting local artists. For more info, see Liam O'Donnell's Web site or his blog, Feeding Change.